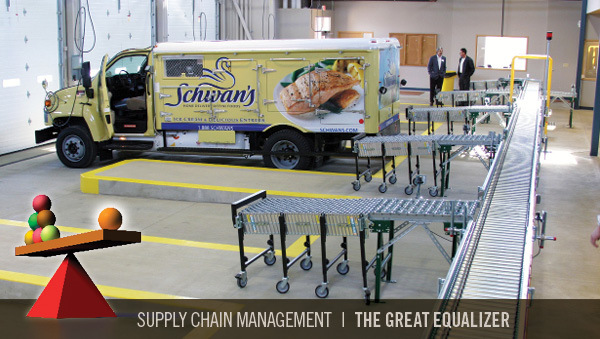 Schwan's Home Services' nationwide depots build daily home-delivery orders from inventory provided by the company's national distribution center in Marshall, Minn. Frequent logistics network optimization, aggressive attempts at collaboration, and partnering with trusted 3PLs act as force equalizers to garner greater supply chain efficiencies. One word captures today's transportation and logistics sector: uncertainty. Shippers and service providers are engaged in a recurring tug-of-war as changing demand patterns challenge broader supply chain paradigms. The backdrop: a slowly recovering U.S. economy teetering on the precipice of a fiscal cliff. In the North American market, these changing demand patterns assume various forms: the rapid growth of e-commerce; intermodalism; migrating consumer demographics; capacity and labor constraints; industry regulation; fuel cost fluctuations; and labor unrest. All these factors are in play as U.S. manufacturers and retailers plan their roadmap for the future. "Five years ago, before fuel indexes began rising every 15 days, companies were in good shape if they optimized their networks every five years," said Gene Long, director of New York City-based Deloitte Consulting, at the Supply Chain Council's Supply Chain World Conference in April 2012. "Today, the half-life on a North American network design, given fuel price volatility and labor costs, is about three years.